A long, long narrow lane connects the Birchams to the Rudhams, and on this day at the height of the barley harvest the great tractors were belting along it like nobody's business with their trailers loaded high. 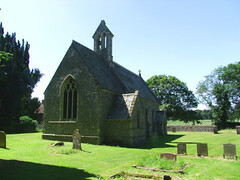 Not far from the Birchams end of the lane there is a farm and a couple of cottages, and with them this little church in a neatly-trimmed churchyard. 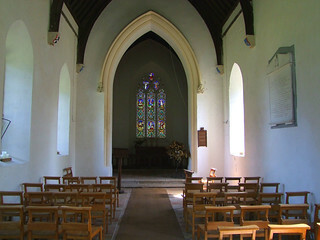 It is the 1853 work of the Swaffham-born architect William Donthorne, who was a major figure in architecture during the first half of the 19th Century, but he didn't do many churches. As far as I know there are only two, and this is the only one in Norfolk. 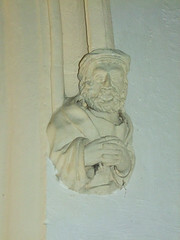 He is best known for the building and rebuilding of some of the county's Big Houses, including Cromer Hall, Elmham Hall, Watlington Hall and Pickenham Hall. However, their early Gothick style rapidly became unfashionable, and most were later demolished or rebuilt in the late 19th Century style. His best-known surviving work today is, ironically, a series of East Anglian workhouses, mostly now converted to residential use. When Donthorne came to Bagthorpe he had just a few years to live. He demolished the old church completely and the new church he built on the same site appears to be his last recorded work. 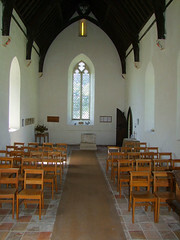 It is an elegant structure in the late 13th Century style with an imposing bellcote on top. 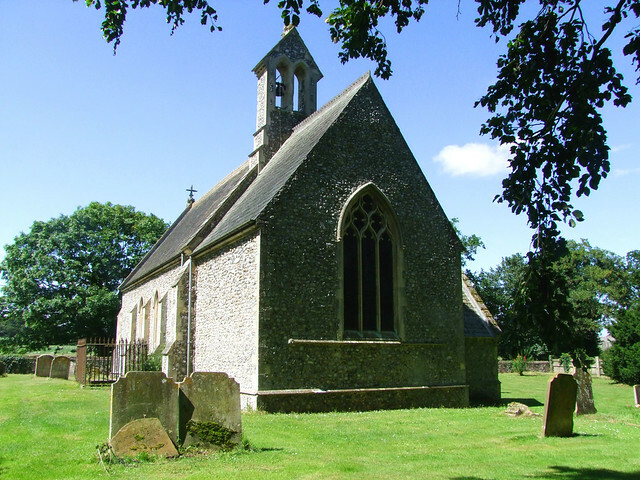 Inside is seemly and simple, very well-kept and obviously well-loved, so it may come as some surprise to discover that St Mary is redundant and in the care of the Norfolk Churches Trust. Isn't it strange that sometimes it takes a crisis like redundancy to remind local people quite how much they love their parish church and how they would miss it if it wasn't there? And unfortunately, of course, it doesn't always work. 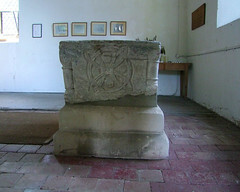 Donthorne retained the Norman font from the earlier church, although it is not in such good condition as some of its neighbours in the great west Norfolk series of Norman fonts. Charles and his better-known brother Alexander Gibbs provided the glass in the east end, which is at once elegant and restrained, although - oh dear! - in the 1850s, stained glass artists had still not got to grips with representing the Ascension as something better than what appears to be a trampolining Jesus. 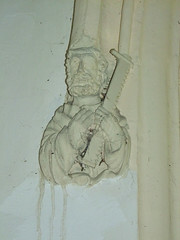 The eastern side of the chancel arch provides a couple of surprises, because it is supported by two large figures, one St Simon holding the saw which would be the instrument of his martyrdom, and the other what appears to be a Jewish religious figure, so possibly Simeon. Having an interest in the name myself, I couldn't help wondering why they were there. There is only one memorial, but it makes up for its paucity by overblown self-importance. It is for the diplomat Sir George William Chad, and records his achievements as including being Secretary of Embassy at the Court of the Netherlands, Minister Plenipotentiary at the Court of Dresden, Envoy Extraordinary and Minister Plenipotentiary to the Republic of Columbia, Minister Plenipotentiary to the German Confederation at Frankfort, and Envoy Extraordinary and Minister Plenipotentiary at the Court of Berlin. As Mortlock observes, it must have impressed the villagers no end. 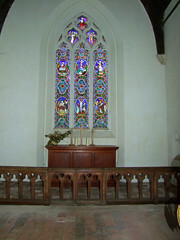 Chad died in 1849, so it seems likely that the family bankrolled the rebuilding of the church to showcase his memorial.